"JO LAROUCHE HAS lived her 13 years in the California desert with her Aunt Lily, ever since she was dropped on Lily?s doorstep with this note: This is Jo. Please take care of her. But beware. This is a dangerous baby. At Lily?s annual Christmas costume party, a variety of strange events take place that lead Jo and Lily out of California forever?and into the mysterious, strange, fantastical world of Eldritch City. 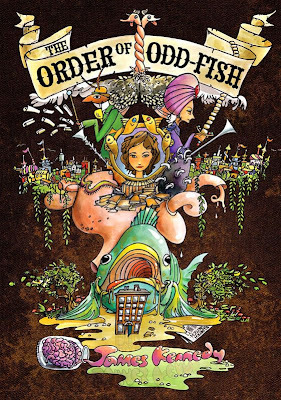 There, Jo learns the scandalous truth about who she is, and she and Lily join the Order of Odd-Fish, a collection of knights who research useless information. Glamorous cockroach butlers, pointless quests, obsolete weapons, and bizarre festivals fill their days, but two villains are controlling their fate. Jo is inching closer and closer to the day when her destiny is fulfilled, and no one in Eldritch City will ever be the same." Anyway, this is a book about a young girl named Jo which is a very sympathetic and relatable character which you can easily put yourself in the shoes to, so to speak. She is quite normal compared to the other characters in the book, but that makes sense seeing as there is a great amount of senselessness going on otherwisely, so the reader is like Jo, an Alice in a rabbit-hole as well as a Lucy discovering Narnia, we're in the mist of madness and just enjoying the view. James Kennedy is epicness of epic proportions! I mean, just look at his website: http://jameskennedy.com/ It looks good, it's incredibly entertaining and the fact that he posts the fanart he has gotten from fans and has fan-art gallery shows makes him all the more wonderful in my opinion. He really, truly cares about his fans and that makes him totally loveable so I'm a fan and has planned to make some Odd-Fish fanart of my own just because it's that brilliant. The radio popped on again. "Ken Kiang here! It just occured to me – you're about to die. Rather makes you wish you'd spent more time cherishing life's little pleasures, doesn't it? Well, too late for that. And you're probably too panicked to remember those pleasures at all. But don't worry, I've drawn up a list! Let's remember them together." He cleared his throath. "Ah, warm summer days… your faverite song coming on the radio… a hot dog at the ballpark, extra mustard and relish…"
"I can't take it anymore!" said Sefino. "When will it all end!" "In one minute ten seconds," crackled the radio cheerfully. "The smell of freshly mowned grass… peppermints… shiny pennies…"
"For the love of Lenin, shut up, Kiang!" yelled Colonel Korsakov. "Chamomile tea," droned Ken Kiang. "Funny puppies- oh, the silly things they do!… the smell of freshly baked bread… dandelions…"
I admit it, I laughed out loud as I read that excerpt, something that brought me quite a few stares as I was sitting on the subway train at the moment. But I loved that and Ken Kiang just continues on being epic, even deciding to write a musical at some point in the story and I adore him, I want to read a book just centered on him. And there is a chapter that tells how Ken Kiang came to the conclusion that he wanted to be evil and he is simply the coolest wannabe-villain ever =0) KEN KIANG FTW! And other characters like Audrey and Sefino (a very vain cockroach) are just as brilliant and there's even a love-plot that is just subtle enough to not make the book a love story, but still makes the reader think: "yeah, Ian and Jo, sitting in a tree, k-i-s-s-i-n-g" in the bestest of ways. They're totally cute together. Men du anmelder fint som alltid, og lista mi over bøker jeg skal lese begynner å bli aaalt for lang, spesielt siden jeg har holdt på med den samme boka i TO FØKKINGS UKER (det er noe sånt som tre tusen år i Ingridmarie-tid).